An event of seismic proportions unfolded in Bangkok today at the TOTAL BWF Thomas & Uber Cup Finals 2018, leaving a trail of records in its wake. For the first time since China entered the Uber Cup in 1984, they won’t be contesting a final; for the first time ever, Thailand are in a Uber Cup final; for the first time since 1981, a team other than China, Indonesia and Korea will be crowned Uber Cup champions. A Thailand-Japan final on the morrow will decide the World Women’s Team champions. Thailand’s defeat of 14-times champions China was a six hour-long marathon that was dramatic from the first exchanges onwards. China, uncharacteristically, fought with their backs to the wall, having fallen in arrears in both singles, and needing their doubles to come to the rescue. After Huang Yaqiong and Tang Jinhua had taken them to safety in the fourth match, China’s bench might have heaved a sigh of relief, for up next for them was the vastly experienced Li Xuerui, the London 2012 Olympic champion who has only recently come back from a long injury layoff. But what unfolded was unlike anything China have been used to. Li Xuerui was a scrambled mess against Busanan Ongbamrungphan, who shot off the blocks with a fierce attacking game and left Li befuddled. The former No.1 got just 11 points in the opening game, but worse was to follow in the second – Li could barely keep the shuttle within the lines. Her famed resilience and array of attacking strokes were nowhere in evidence; with every mishit, China’s Uber Cup defence melted in rather embarrassing fashion – and on the 33rd minute – the shortest match of the five – Ongbamrungphan nailed the match 21-11 21-9 and Thailand’s players rushed on to court to celebrate what will be remembered as one of the finest moments in their country’s sporting history. For the crowd, it was a fitting finale to a session of topsy-turvy fortunes. Thailand had gone in against China having not won any of 16 in the individual head-to-head contests. Ratchanok Intanon, her career record 0-4 against Chen Yufei, fell behind in the first game but gradually worked her way back; the fluttery netshots and crisp attacking shots wearing down her young challenger: 15-21 21-9 21-14. Jongkolphan Kititharakul and Rawinda Prajongjai too were 0-4 against Chen Qingchen and Jia Yifan. With a near full-house crowd behind them, the Thais played well above themselves, gaining leads in both games and playing off the crowd’s energy before falling 21-17 22-20. Nitchaon Jindapol just about staved off Gao Fangjie in a tense second game, putting the hosts ahead once again (19-21 21-19 21-12), before another thriller unfolded in the second doubles. Puttita Supajirakul and Sapsiree Taerattanachai’s contest against Huang Yaqiong and Tang Jinhua was a thriller all the way. The Chinese missed six game points in the first but got their act together and their defences better organised as the match wore on. 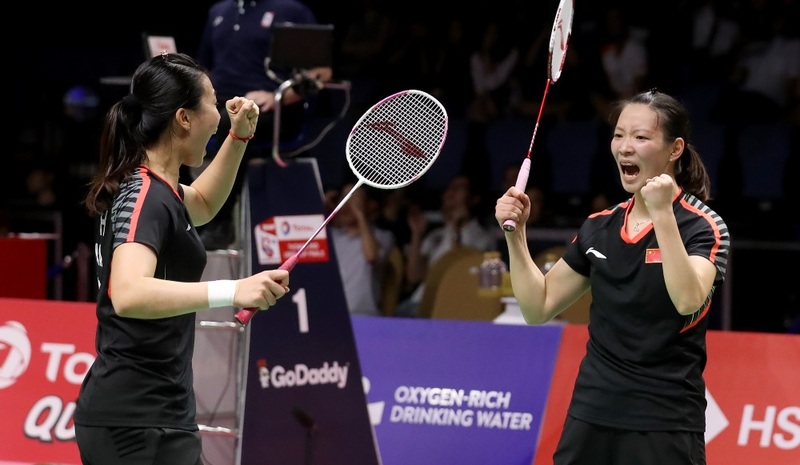 They fought off a deficit in a tense end game past the battling Thais, 24-26 21-17 21-18, in a match that went 98 minutes, setting the stage for the fifth and deciding contest between Ongbamrungphan and Li Xuerui. In the meantime, Japan were through with their semi-final against Korea, 3-1. The Koreans did surprise the Japanese in the first doubles, with scratch combination Kim So Yeong and Shin Seung Chan delivering a power-packed performance to stun Yuki Fukushima and Sayaka Hirota, 21-19 21-15, and making it a point apiece after Sung Ji Hyun had lost the opening encounter to Akane Yamaguchi, 21-10 21-13. World champion Nozomi Okuhara wasted little time in making it 2-1 for Japan, outplaying Lee Jang Mi 21-9 21-15. 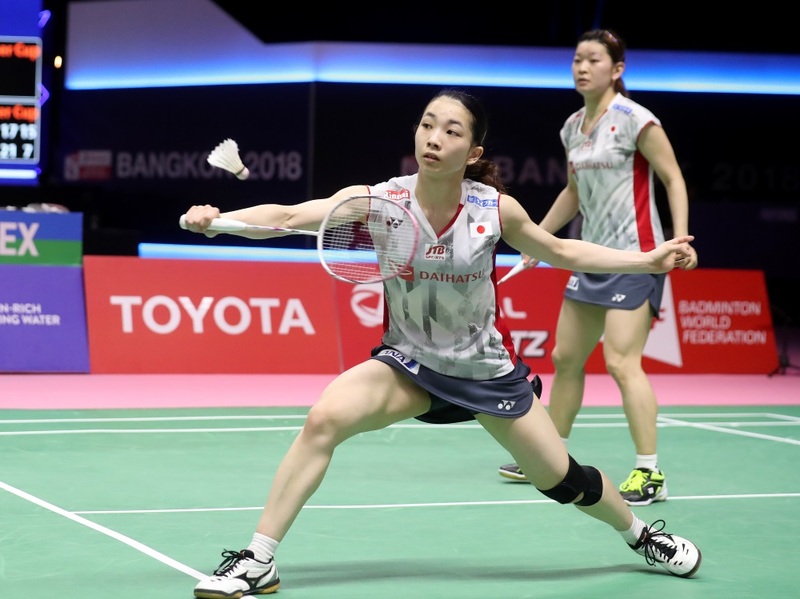 Olympic champions Misaki Matsutomo/Ayaka Takahashi were up against teenagers Lee Yu Rim/Baek Ha Na and the young Koreans did put up a dogged fight, taking the second game, before the Japanese reasserted themselves in the third: 21-11 17-21 21-14. 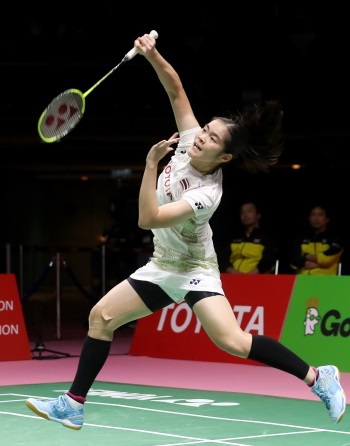 Thailand head coach Rexy Mainaky, in his forecast of the final, said Japan had the advantage in singles: “In the second and third singles, it will be 55-45 for Japan,” Mainaky said. “But on court it might be different, like what we showed today – we took all three singles.